Off Grid power systems are a convenient and reliable way to get power when the power grid is too far away, too expensive to access or simply doesn’t exist where you want to live. Blackmores Power and Water have been designing, building and servicing Off Grid power systems for more than 12 years and have the experience and knowledge you can rely on. Solar Panels can be installed on an existing building or mounted on purpose built ground frames. 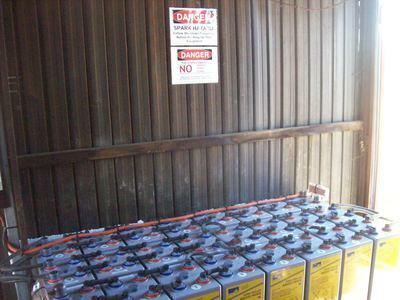 Batteries are selected to ensure maximum reliability under site conditions. Maintenance free GEL batteries are an ideal choice for solar applications as they offer increased performance and up to 15 year design life. Depending on the application the battery bank can be configured for 24, 48 or higher VDC. The inverter in an Off Grid application not only converts the stored DC voltage to 240v AC it also monitors all aspects of the system operation. It compares load, input from renewable energy sources and how much energy is stored in the battery bank. Depending on how the various parameters are programmed on installation it will also start and run a suitable backup generator at peak efficiency for the minimum period required. This process is seamless and automatic with no interruption to your supply. You may not even know the generator has run. Depending on the requirements of the project remote communication may be possible and enables Blackmores Power and Water staff to remotely monitor the performance of the complete power system. 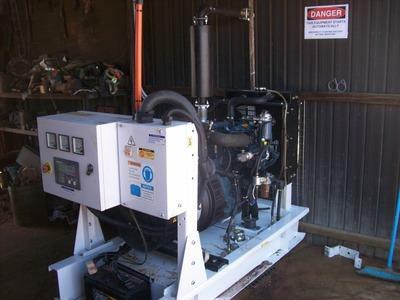 A generator is incorporated into the Off Grid Stand Alone Power System to provide back-up to the solar panels during extended periods of inclement weather or to assist with peak loads such as shearing, air conditioning etc. What is an AC Coupled Solar Array? This is a relatively new innovation for using the power produced by solar modules in a Stand Alone Power System. In the past, typically the energy from the solar modules was used to directly charge the batteries and is known as DC coupling. The DC energy stored in the batteries was then converted to 240V AC by the inverter for use by standard 240V equipment. Contact Blackmores Power and Water for an Off Grid Information Pack. Read the information provided and complete the questionnaire. Organise an appointment with our off-grid solar team to discuss system options and a site inspection if required. Blackmores Power and Water will provide you with a detailed quote for your consideration. Once the quote is accepted an installation date will be arranged. 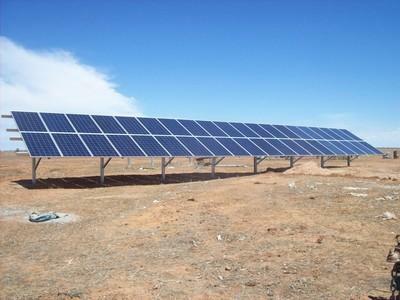 Installation of your Off Grid Solar Power System will be completed and commissioned. Final paperwork and documentation will be prepared and sent to you.